Ahhhh It's Reveal Week!! Thank you to the One Room Challenge for hosting this fun 6 week adventure. 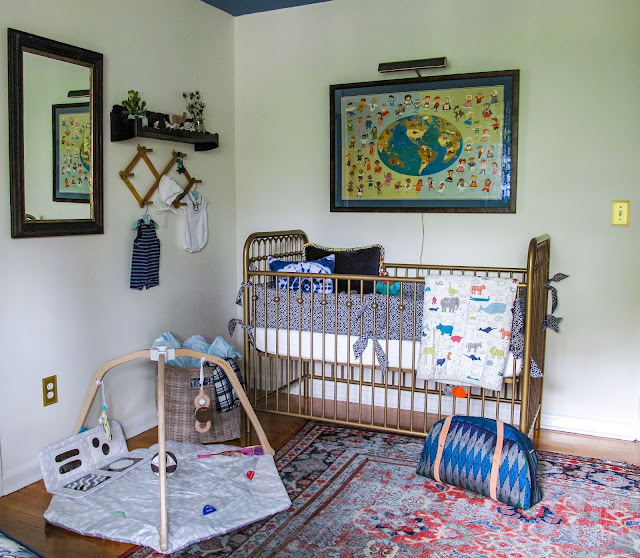 It's been a whirlwind these past few weeks and I'm thrilled to show you brothers global nursery. Let's get the tour started! The theme for the nursery: a global little gents room came together naturally. It also has a "something old, something new, something borrowed, something blue" vibe. 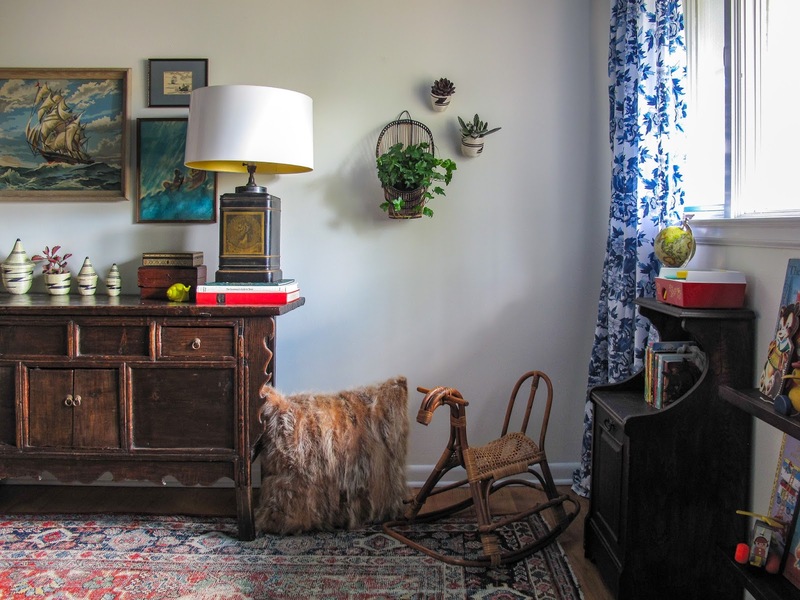 The blue is obvious but I started realizing that while I have lots of new pieces the room is filled with vintage finds and borrowed treasures. The borrowed pieces- books, toys & clothing that were mine or my husbands from when we were children. I love the story that each pieces tells! 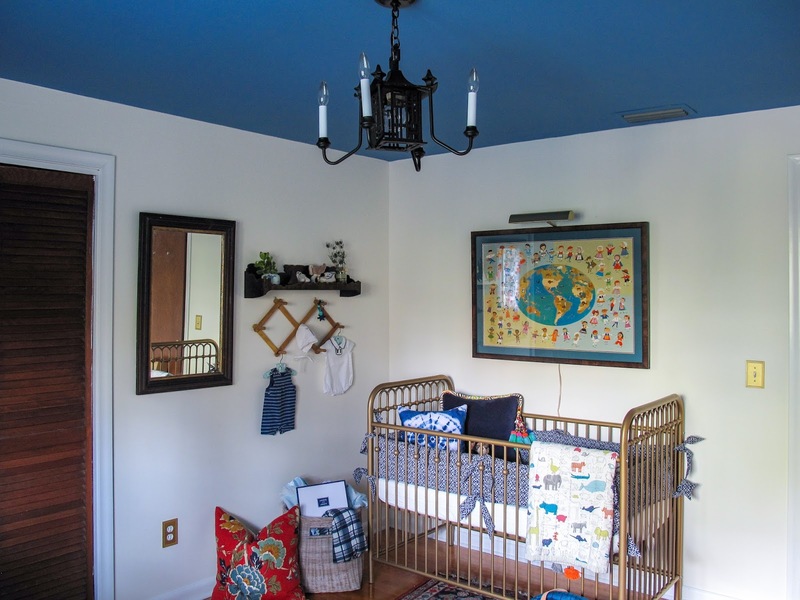 I love how the ceiling paint brings an extra element to the room! 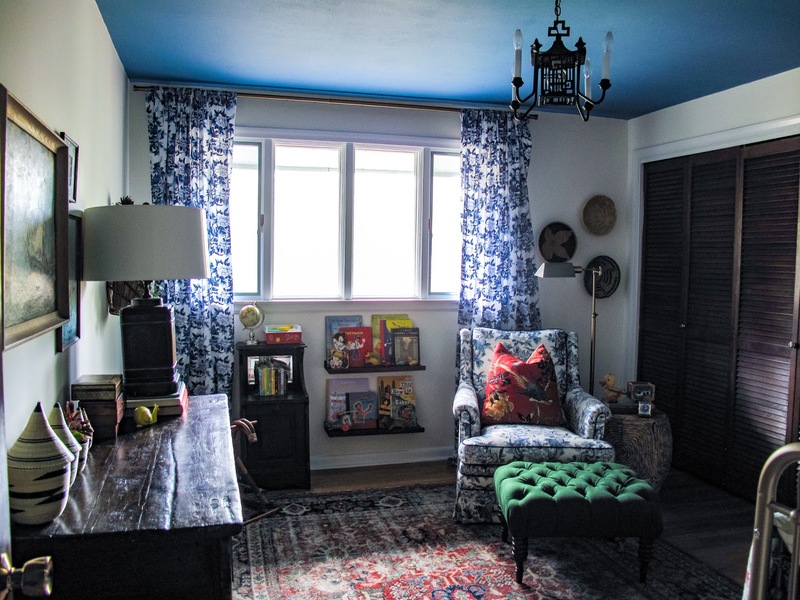 Thanks to Color Consultant, Thomas Mach, for suggesting this vibrant Farrow & Ball color. He answered every question we had about what sheen to order, what brushes to use, how to prime the ceiling & the list goes. He is so helpful and knowledgable. 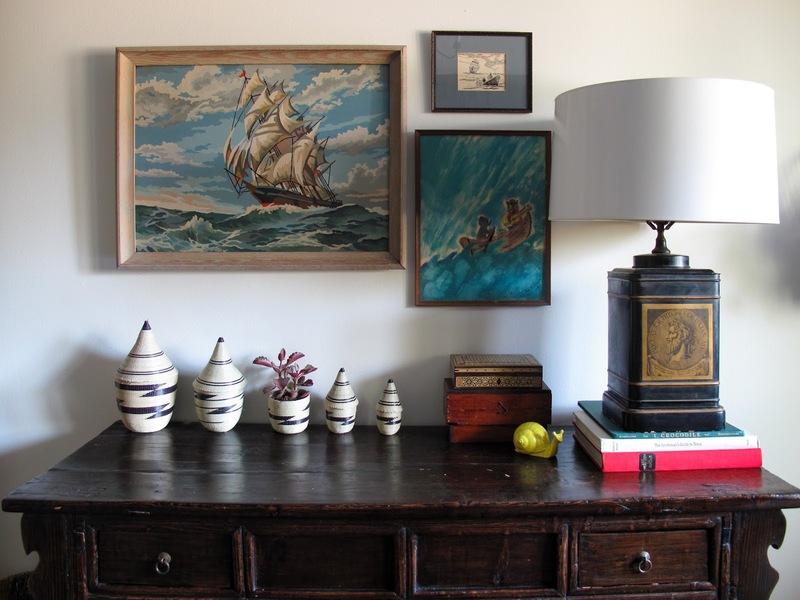 Want to know more about the process and Farrow & Ball paint? I talk about all that in Week 4 of the challenge HERE or you reach out to Thomas. The oriental Rug set the tone for the colors of the room. I found it about 2 years ago in Dallas and have been trying to find a spot for it ever since! It has so many vibrant colors and was a perfect fit as I wanted the nursery room to be colorful. A huge thank you to Lamps Plus for this lovely nursery seating area! 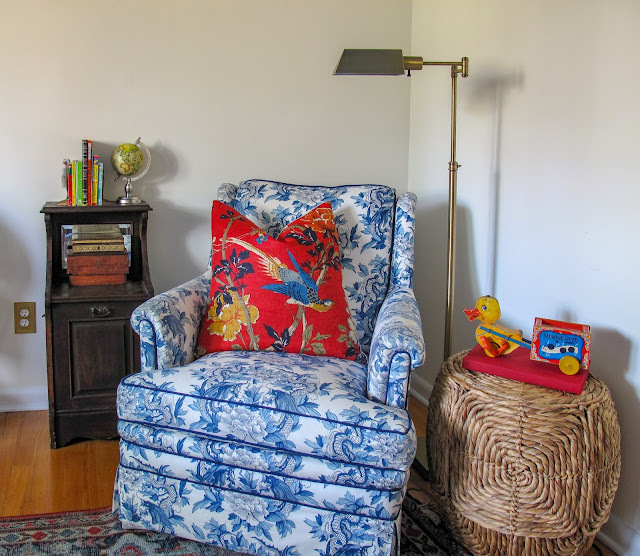 The chair and drapes I already had and are a vintage chinoiserie Ralph Lauren pattern. I love how the ottoman and sea grass side table work with the brass reading lamp and blue chair. I can't wait to cozy up with brother in this comfy spot! 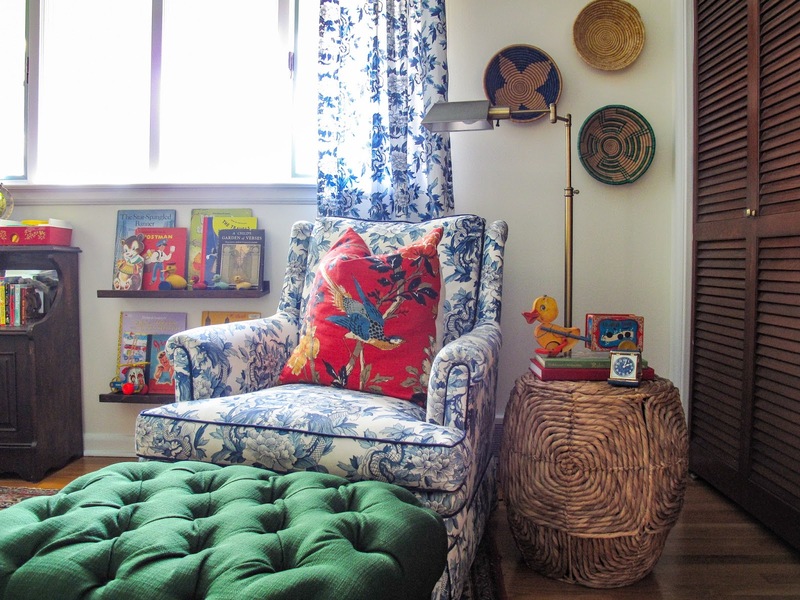 This tufted ottoman and reading light make it the perfect spot to read books and lounge with baby boy. I loved treasure hunting for this room! 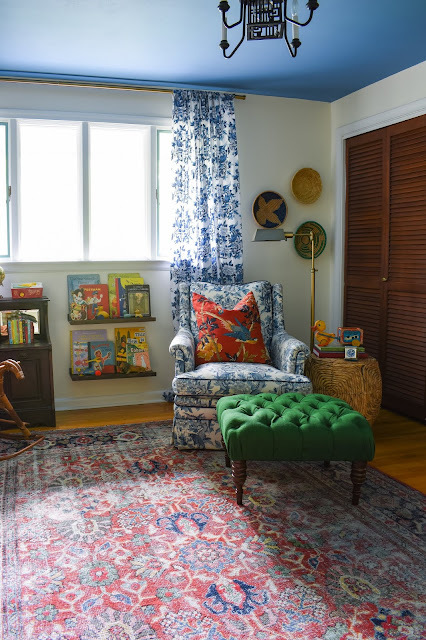 The vintage toys really make the room come alive and bring out the colors of all the other furniture pieces. Each time I design a space I always check in with my friend Bianca - she knows me! She knows my style and I love bouncing ideas around with her. Designing this room pregnant was tough. I felt like my brain was at half capacity and I struggled to make decisions. I'm so thankful for her help and for all the times she talked me off the design ledge ha ha!! Thanks to Bianca, who suggested these walnut stained shelves from Target! 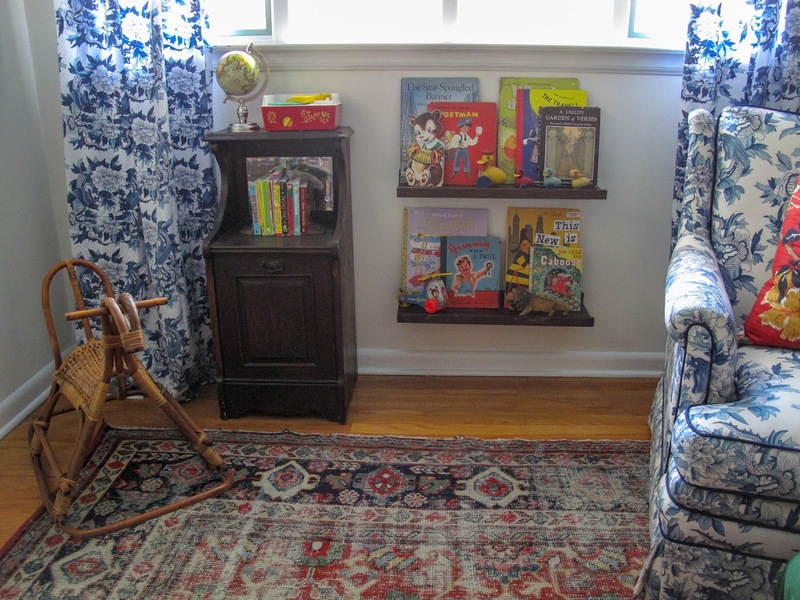 They were the perfect depth to be able to display books and vintage toys. Some of the books were my husbands and mine from when we were children. I repurposed this antique coal bin for toy storage. I wanted a touch of green in the room and thanks to the Sparrow Studio for creating these hanging wall plant baskets! The hand woven baskets are the perfect home for these little succulents. The artwork on the bottom right was painted by my dad when he was 10! 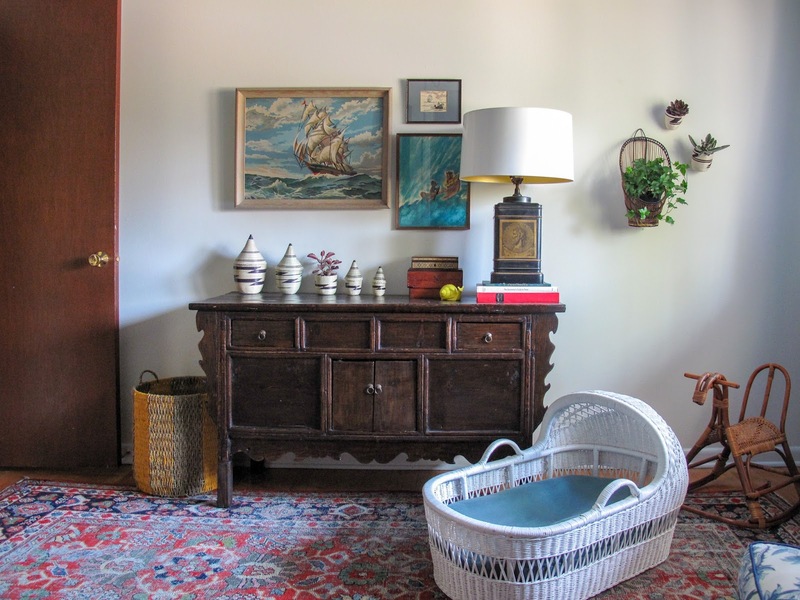 All the other pieces in this shot are vintage (minus the baskets) The large yellow toy basket is from Target's opal house collection. The wall baskets and set of 5 nesting baskets are from The Sparrow Studio. The placement for each piece in the room was a struggle. 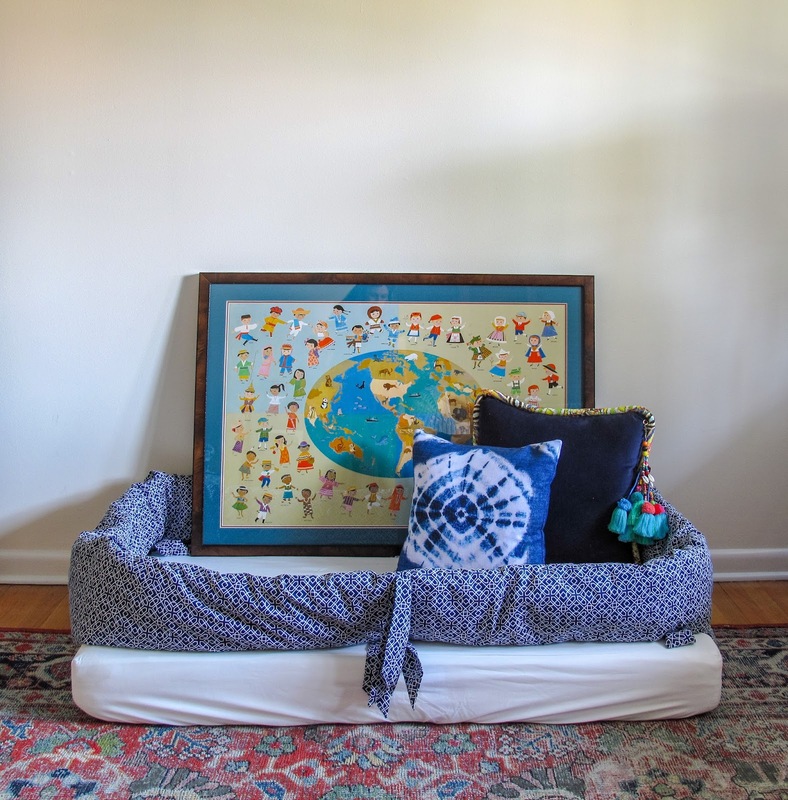 The artwork anchored the crib (a framed vintage poster- with Lamps Plus Picture Light) and figuring out the best spot for it took lots of furniture moving. Check out the play gym from Lovevery Baby. It has one year of play all in one spot. How handsome are these pillows from Smithhonig? The tie dye shibori print pillow in front matches our powder bathroom wallpaper and the velvet pillow has a stunning trim and tassel. My favorite part of the 6 week challenge was the styling. This antique mirror was the perfect pair with the wood shelf my father made years ago. 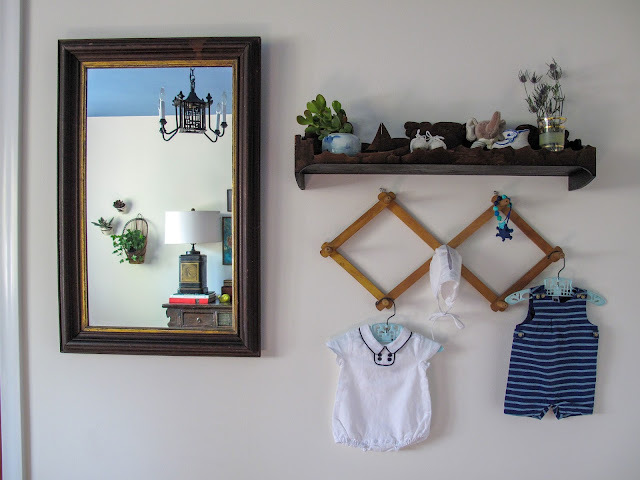 The little shoes on the shelf were my husbands when he was an infant. How fabulous is that brass electrical cover?? 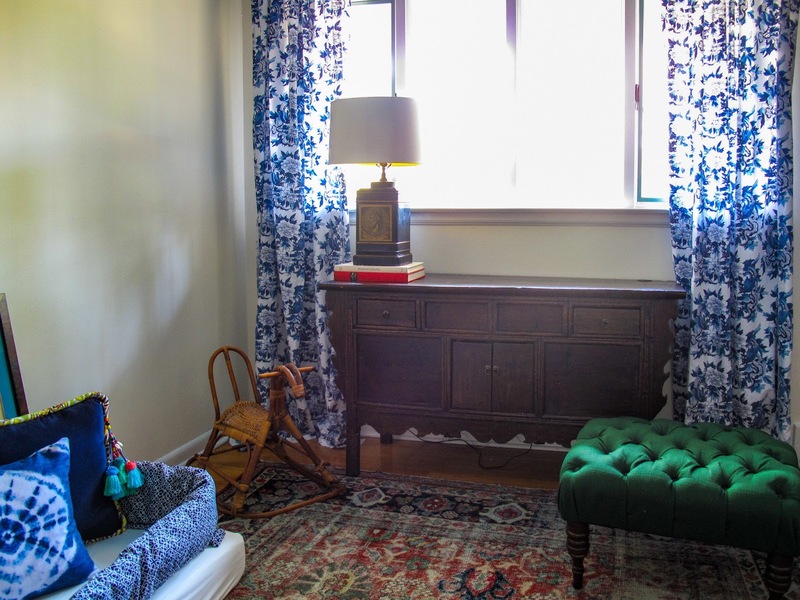 Liberty Hardware made the little details in this room come to life. The grey basket, from target, will be great blanket storage and currently also holds my Heritage Plaid Solly Baby Wrap- the softest wrap I've ever felt! 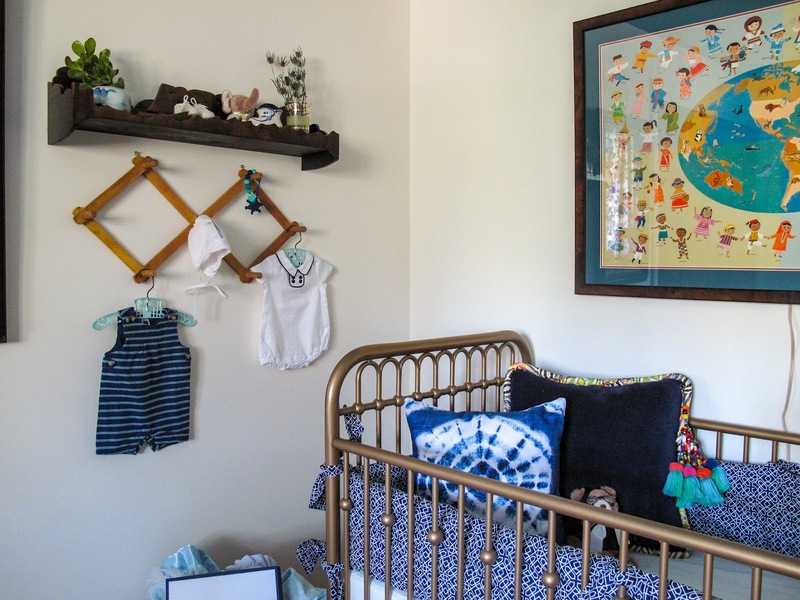 The vintage peg rack holds brothers new digs from Janie & Jack- find the collared onesie HERE and the striped onesie HERE, as well a bonnet that my husband wore when he was babe. I can't wait to see brother in his new little outfits. Added bonus- the view in the mirror of the vintage pagoda chandelier and blue ceiling! I'm always surprised at how all the little details come together! 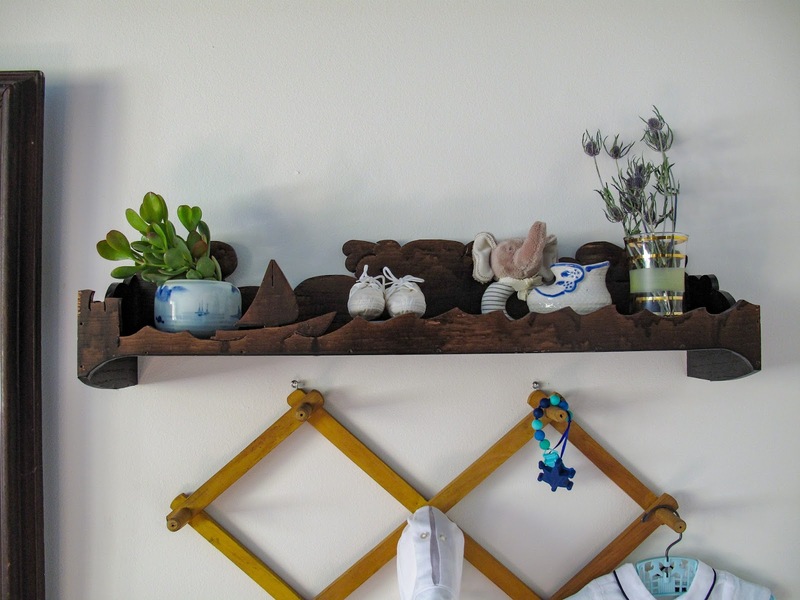 We stained the shelf to work with he other dark wood pieces in the room. How fun is that little sail boat!? Can you believe this is where we started out??!! It's been a complete transformation. I can't wait to do another room;) Thank you for following me on this crazy journey!! Don't miss the source list below! **Several of the below items are sponsored - rest assured the thoughts and opinions are my own. 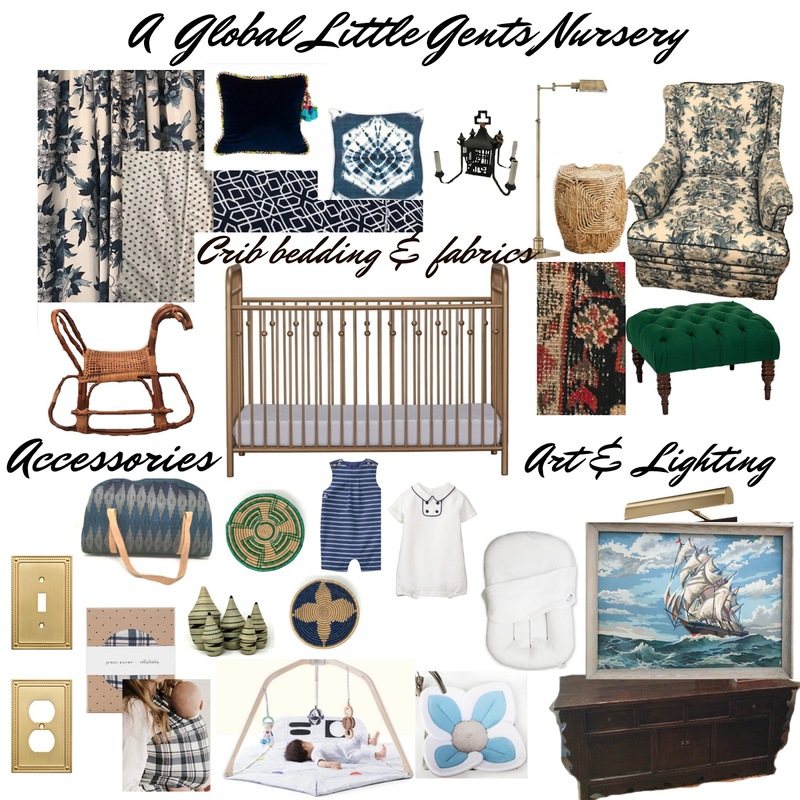 I sourced each of these products and carefully chose them for my nursery and promise to provide honest feedback as I use the items in the nursery. Now make sure to check out the other reveals over at The One Room Challenge!! 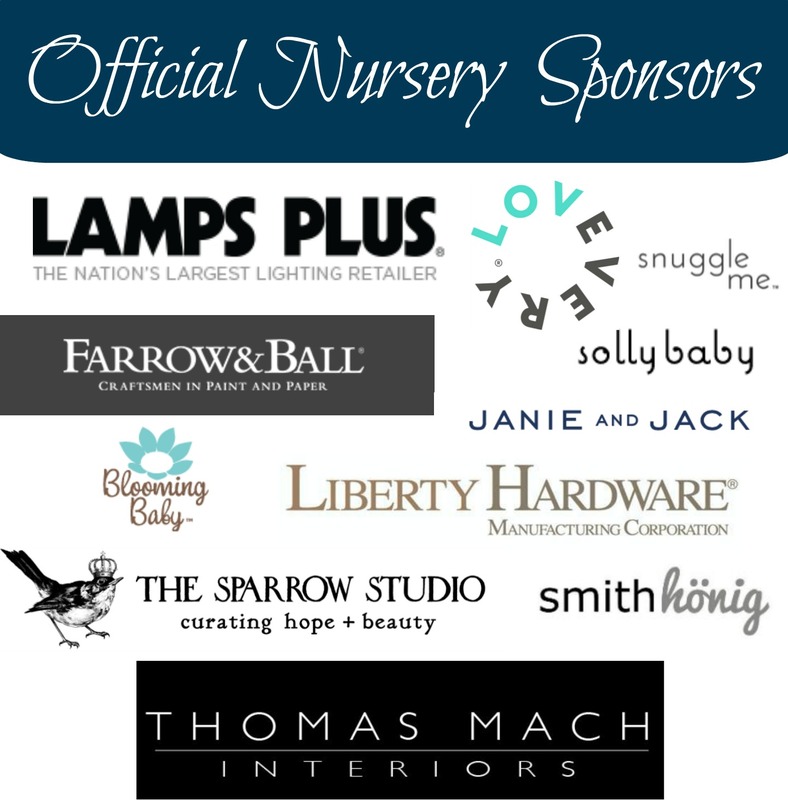 Thank you to my wonderful sponsors for making brothers nursery come alive! 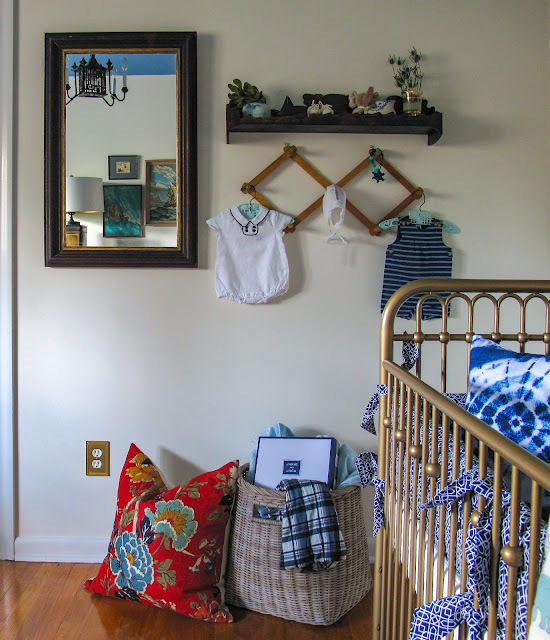 The nursery is well under way but it's the final touches that make the room- don't you agree?! 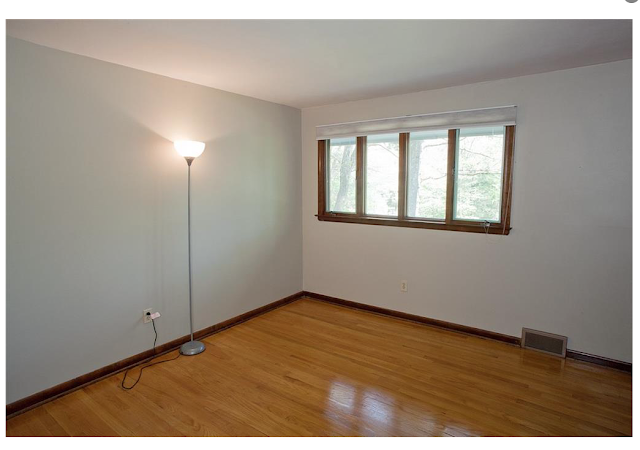 The walls are currently bare and I can't wait to start styling the room. 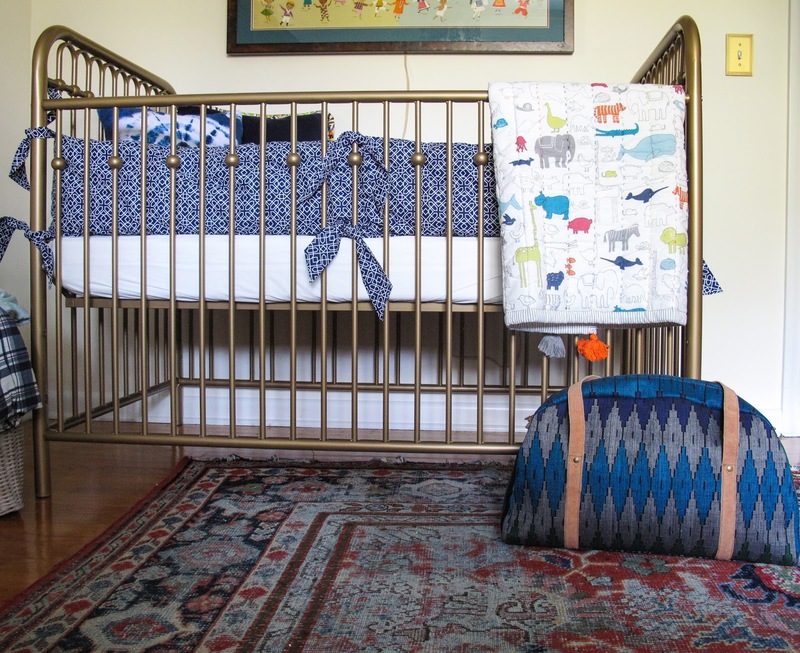 We are waiting for the crib to arrive this week. So.......here's what we have so far! 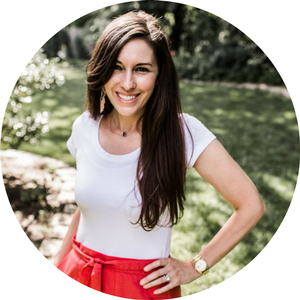 But first, thank you to the One Room Challenge for hosting this fun 6 week challenge. I can't wait to view everyones updates! The nursery seating is coming together! Although, I've moved this set up around at least three times now! I've really struggled with finding the best placement for the pieces in this room- I blame the hormones;) Thank goodness for FaceTime so I can talk through the room with my bestie Bianca! I'm loving the mix of the sea grass side table and brass reading lamp from Lamps Plus- find the side table HERE and the lamp HERE - as well as on my source list below! **Cautionary Tale- I found this vintage poster for $12 a few years ago at an estate sale. Having it professionally framed meant it would be pressure sealed (yay for the paper laying flat!) and I could double mat it in a custom size but the cost was $215 So much for affordable art! Ha ha!! I have to say it does look amazing & thanks to Hobby Lobby it now makes much more of a statement. Last snap shot, check out the pretty brushed brass electrical plate cover from Liberty Hardware. We added these and I LOVE the finishing touch it gives to the room! 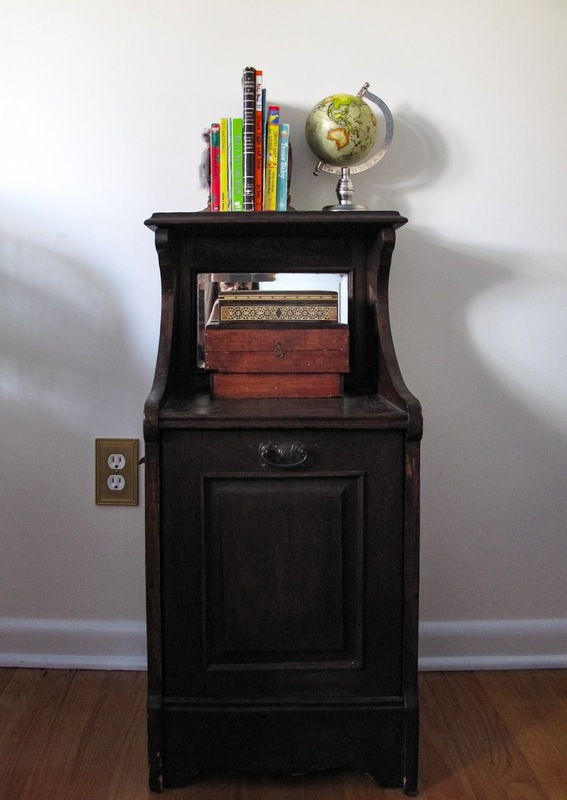 Doesn't it look great next to this antique coal bin? I'm repurposing it into a book shelf/toy storage. 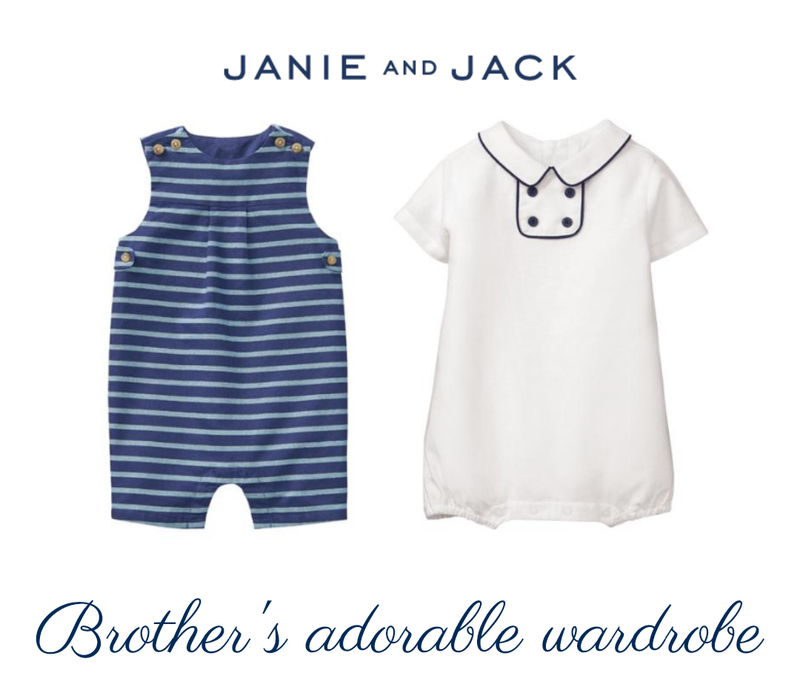 Check out my live stories to see Brother's new clothes thanks to Janie & Jack Childrens Apparel! These cuties will be on display next week for the big reveal! 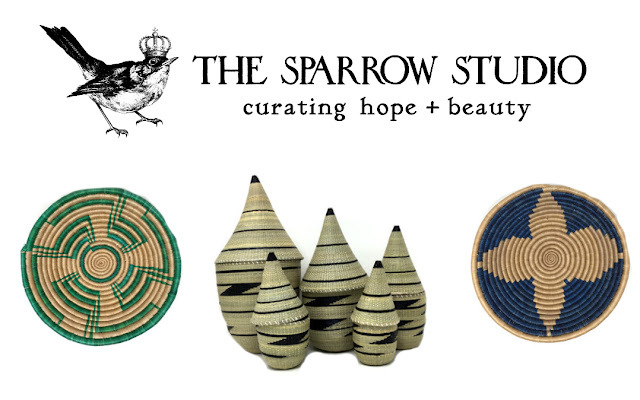 Above are Rwandan baskets The Sparrow Studio sent and I'm thrilled to display them in the room! Each basket is hand woven out of fibers from the agave sisal plant. The set of 5 nesting peace baskets are made of sweet grass and will be great for play time as they stack inside each other- each one opens up to a tiny surprise. Stay tuned for next week's FINAL REVEAL!! I can't wait to show you the completed and room!!! 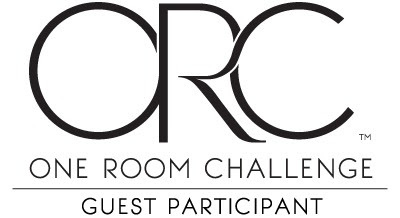 Now make sure to check out the progress of other guest participants at The One Room Challenge!! Thank you to my wonderful sponsors for making this room come alive! While several products in the nursery are sponsored the thoughts and opinions are my own.